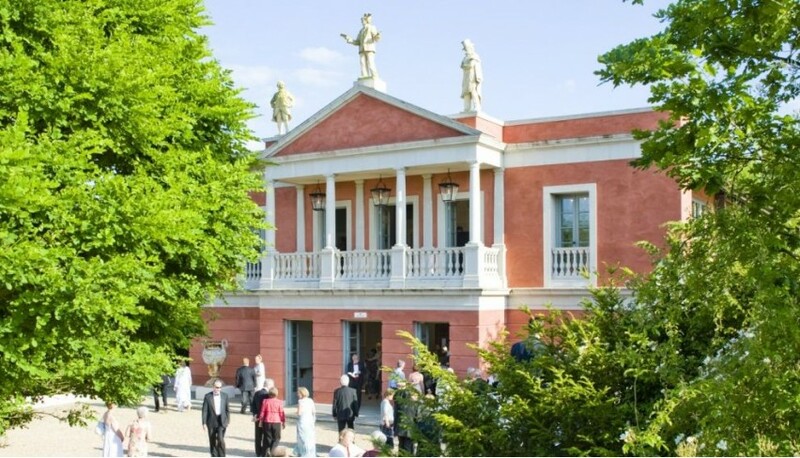 I was privileged to nab a ticket to the third of four scheduled performances of Tristan und Isolde at the Longborough Festival Opera on June 18. It was delightful in every way. The women are lovely in flowered dresses that flow in the breeze, the men mostly in dinner jackets with colorful bow ties and seriously silly straw hats, as if to belie the profile of a dowdy Wagnerian. Then into the salmon-colored theatre, accompanied by a solo trumpet summoning Tristan’s “Death-Devoted Heart” theme. Martin Graham comes out onto the stage to welcome his friends – the theatre seats only 500 and one assumes without challenge that everyone (except for me) does, indeed, know Martin. There follows an unforgettable and unique afternoon of theatre as only Wagner could dish it out. It is a narrow auditorium and a plain and short stage. I cannot imagine doing the Ring here, which they did to international acclaim in 2012. The pit is partially shoved under the stage and the conductor, Anthony Negus, elicits a world-class performance from the 61-instrument band. This is Grand Opera offered on a chamber opera room, yet with no compromise at all with the sound, the commitment and the exuberance of the musical event. It is as if one had been invited by Wagner to the reading on that evening of September, 1857, of “the poem” in Zurich, but instead of the words alone we get the whole enchilada. Privileged indeed. Neal Cooper and Lee Bisset played the title characters, to very great success. They were musically sound (though somewhat tired by the end) and at times went well beyond that. They knew the roles intimately and, in this intimate setting, their understanding read. Her scorn and sarcasm, his fear of being alone with her, their desperation for an end to it all – these laced through Act I to convey immediately what was at stake. They played to each other rather than to a 3800-seat house, and his pianissimo passages were startling in their confidentiality and self-realization. Andrew Slater gave us a Kurwenal from whom no more could be asked, and Harriet Williams’ Brangägne was as fine as one could imagine. Stephen Rooke’s Marke was solid and satisfying, but he missed that ineffably majesty of sorrow that actors in this role can sometimes achieve. Carmen Jakobi’s vaguely Jungian take on the production was not heavy-handed, and with designer Kimie Nakano and lighting by Ben Ormerod a staging was achieved that, miraculously, fit both the modesty of the theatre dimensions and the oceanic scale of the work itself. In an unfortunate and completely uncharacteristic lapse of taste, Ms. Jakobi had a pair of dancers portray events that were narrated or musically depicted – Isolde’s narration in Act I, Tristan’s remembrances of his parents in Act III, the orgasmic copulations in Act II. It takes nothing away from the excellent dancers themselves (Katie Lusby and Mbulelo Ndabeni) to report that this intrusion was a completely unwelcome and regrettable distraction. We leave the theatre at about 9:00 with the sun just setting in a glorious mid-summer splendor of Gloucestershire dazzle. Thick plots of field, sheep, the odd majestic oak, cows peppered about. If such an intimate experience of such a miraculous work of art doesn’t set one’s mind to spinning then nothing will. In a follow-up post I share some thoughts prompted by this magical experience. was it recorded, i hope? A lovely review. It captures something of the magic of Longborough, and the non-corporate, non-flashy feel to the place. Martin Graham does indeed address his audience as friends. What a couple he and Lizzie are, and how grateful many of us feel to them. In this context, it seems a shame to grumble about any aspect of the production at all. It is done with love, as the conductor said on the last night of Tristan. I share other reviewers’ discomfort, however, with the ‘Jungian dancers’. There was no need to have them wriggling about when the music and the intensity of the performance more than adequately carried us through the experience of not-much-happening-on-stage. A lack of confidence, perhaps, leads directors to do such things. Let us hope for a Tannhäuser production next year which will be free of such gimmicks. The music, the passion, the chicken shed, and the performance are enough. Lovely piece. King Marke was played by Frode Olsen. Stephen Rooke was Melot.